Luke Cox, 21, grew up on an arable farm in Gloucestershire. He is currently in his final year at the University of Reading where he studies agriculture, and is working with the university to raise the profile of the farming industry among students and staff. Luke Cox, 21, grew up on an arable farm in Gloucestershire. 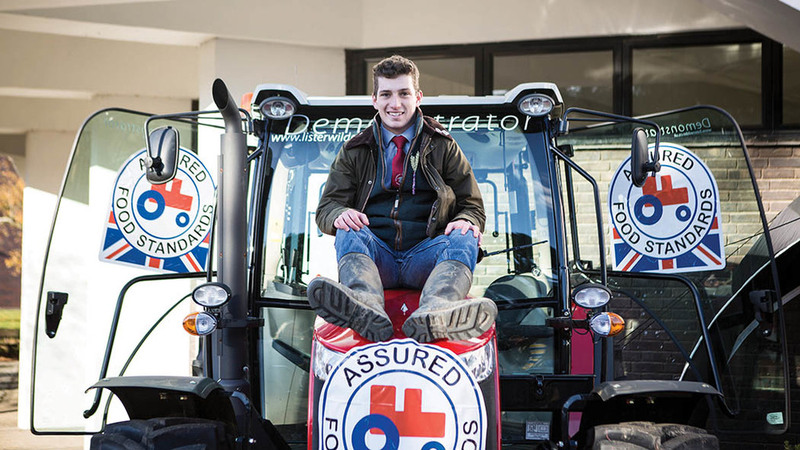 He is currently in his final year at the University of Reading where he studies agriculture, and is working with the university to raise the profile of the farming industry among students and staff. Arable: Growing up on a farm is different for every farmer. My dad ran our arable farm pretty much by himself and, although I always helped out at harvest, I loved the freedom it gave me. Now I am older I can really appreciate the work he put in day after day so that I could have that freedom. One thing I have learned as I have got older is that farming is hard work. It requires long hours and close maintenance, and results often depend on elements outside our control. I started studying agriculture at the University of Reading three years ago in order to learn more about the industry and how to run a sustainable farming business. Back British: I have been encouraging my peers and the university to help promote the hard work of British farmers, and it has really taken off this year. I proposed the idea of the university hosting a Back British Farming Day because I believed Reading could do more to raise the profile of British farming on campus and to the wider public. The University of Reading is consistently one of the highest ranked universities in the UK for agriculture, but it never actively promoted British farming. Hosting its own Back British Farming Day and pledging to support our farmers was a good way to change this, and we are the first university in the UK to do it. Consumers: Personally, the main driver behind pitching the event was the disconnect between the public and how their food is produced. to look out for to identify UK-produced food. This event was the first of many interactions with students and staff aiming to provide the information that has so far been lacking. We want to use the NFU’s Back British Farming campaign to educate our peers on things like the Red Tractor logo, how to identify where their food was produced and recognising the high welfare standards it was produced to. I am hoping this will become an annual event for the Agricultural Society here and perhaps other universities will be inspired to use it as a blueprint to actively promote British farming.